It's rare to get a standing ovation at the end of a show these days – and it's almost unheard of for one to be given for an actor who's not even present. But such was the level of goodwill towards Gerard Kelly, who died at the age of 51 after a brain aneurysm three weeks before rehearsals of this show began, that the audience rose as one and applauded at the mention of his name. And this on a Saturday matinee. This was Kelly's catchphrase, which he modifies to "Hiya gang" – a gesture typical of his approach to the role. By his own admission, this is a transitional performance (Kelly did the job for 20 years), and he makes this Muddles a familiar blend of manchild fun and foolishness, cheeky but good-hearted. He does a persuasive job, but it's not until the community song that he shows signs of making the part his own, bantering with the audience and showing himself to be a gifted comedic actor with a ready wit. Elsewhere, the show is well plotted, with Barbara Rafferty's Queen Morgiana immediately establishing herself as a force of evil, and Pop Idol's Darius Campbell (formerly Danesh) looking – and sounding – every inch a handsome prince worthy of Julie Matheson's Snow White. The dwarfs are an amateurish bunch whose lines tend to get swallowed up, but what's really missing is a dame to add some raucousness to a show that's big on love and short on danger. Actor Alan McHugh has been developing a sideline as the writer of a strand of psychologically disturbing Christmas shows at Glasgow's Citz. Where last year's Cinderella was a dark tale about absent mothers, this year's Beauty and the Beast is a rich metaphor about acquiring self-knowledge and taking a leap into the sexual unknown. In a neat twist of convention, Gemma McElhinney's Beauty is all the things you expect her to be – generous, hard-working and true to her word – but also too squeaky-clean for her own good. Willingly clearing up after her father (a Dickensian merchant with a penchant for upturned aphorisms) and never passing judgment on her fun-loving sister, she represses her own animal urges in an Apollonian drive to do the right thing. It can't last. "The wildness beats within me," she admits in one of the songs in Claire McKenzie's excellent jazz-Latin live score, before venturing off to meet the Beast in his house in the forest. She tells herself she is there to fulfil a promise made by her father, but really it is to embrace the thing of which she is most afraid. The creature – a raggedy wolf-man played by Jim Sturgeon on Philip Witcomb's brooding, haunted-house set – is forever accompanied by the jealous witch who transformed him as punishment for his womanising ways. It means Beauty must navigate past her father's authoritarianism, her sister's hedonism, the witch's duplicity and the Beast's dark sexuality. By sticking to her principles and learning to love herself, she also manages to transform the other characters for the better. The result, in Guy Hollands's serious-minded production, is lush, dreamlike, creepy and emotionally satisfying. If there's a rule to be broken about family-centred theatre, playwright Chris Hannan breaks it. His brilliant version of the Alexandre Dumas stories is rude, anarchic, witty, intelligent, irreligious and coarse – the more so in Dominic Hill's production, designed by Colin Richmond to look like a scene of plague-ridden theatrical dilapidation in sore need of a good revolution. If you're looking for conventional role models, you won't find one in Beatriz Romilly's Princess of Spain who, although "as posh as a pineapple", is pregnant to an unnamed father. Thrillingly, no one finds this a problem, least of all Alexander Campbell's gloriously effete King of France, who is so smitten with her that he changes the new baby's nappies. 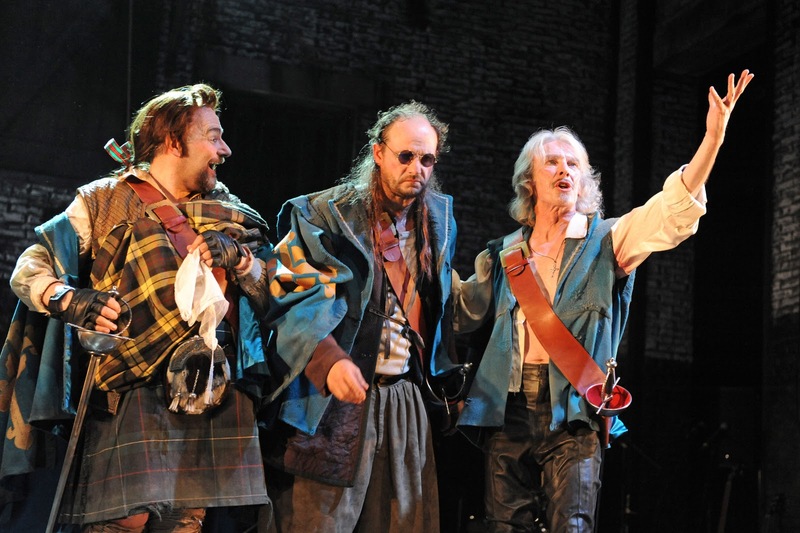 And if you're looking for conventional swashbuckling heroes, you won't find them in Porthos, Athos and Aramis. These musketeers are a merciless portrait of masculinity in crisis: obese, drunk and narcissistic. Throw in an extended farting scene, gags about front bottoms, excrement and womanising, and a vision of the church as a bastion of immorality, and you should find yourself a long way from child-friendly entertainment. This is no show for tots – Rachael Canning's creepy skeletal puppets will see to that – but it is underpinned by such a keen sense of good-versus-bad, and enlivened by so many breathless sword fights and a great live folk-punk score, that it holds the entire audience. Above all, what we get in Oliver Gomm's D'Artagnan and Cynthia Erivo's Constance is a compelling existential journey towards self-discovery in which the hero strives to breach the two-dimensional constraints of his comic-strip character. When finally he says the word "love", it makes you cry. Until 24 December. Box office: 0131-228 1404. Theatregoers in Scotland used to have a simple choice at this time of year. Either they went to a traditional pantomime or to one of Stuart Paterson's Christmas shows: big-hearted fables that preferred psychological realism to slapstick and narrative complexity to stock plots. About five years ago, for no obvious reason and despite their popularity, Paterson's plays all but disappeared. In this, the coldest winter of all, it seems all the more appropriate that the Royal Lyceum has rediscovered The Snow Queen, even if the play's promises of better weather to come draw desperate cheers from an audience a little too familiar with the snow flurries Paterson calls "the swarming of the white bees". In this telling, the chilling Hans Christian Andersen tale becomes a great feminist saga. Less interested in the coming-of-age journey of Mark Prendergast's Kay, Paterson focuses on Helen Mackay's Gerda. Her pure-hearted attempt to rescue her friend from the sexually warped clutches of Allison McKenzie's blue-lipped Snow Queen demands courage and valour. She is serious, likable and true. Paterson's nods to panto-style comedy can seem stiff and half-hearted (though this show has a particularly funny band of robbers), and he could have explored more fully the relationship between Gerda and Kay. But Mark Thomson's production picks up a breakneck pace as it hurtles towards the interval, paving the way for an unsettling second half in which Paterson, drawing deep on mythology, introduces talking animals and voices from the dead to add to the gravitas of little Gerda's quest. It is not as lavishly presented as the Lyceum's Patersons of a decade ago, but the performances enliven a deep and urgent story, reminding us of what we've been missing.